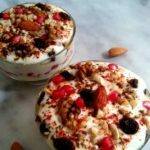 Layered fruit and nut raita | Fruit and nut raita is a delectable combination of mixed dry fruits, nuts, some fresh fruits, and thick curd. A simple and healthy recipe can be made within minutes. Put the curd in a strainer and leave it for 15 minutes. Once the water separates from the curd, transfer the thick curd to a mixing bowl. Add honey to the curd and beat well. Chop all the dates and nuts and set aside except those for garnishing. In a glass serving bowl put a layer of fruits followed by a layer of dry fruits with nuts and a layer of thick beaten curd. Sprinkle some black salt followed by roasted cumin powder, red chili powder and crushed dry mint leaves. Again add another layer of fruits followed by a layer of dry fruits and nuts. Add a layer of beaten curd topped with some pomegranate seeds, raisins, and whole nuts. Finally sprinkle some black salt followed by roasted cumin powder, red chili powder, and crushed dry mint leaves.